No one wants to look like a "newbie" when it comes to their RV and sanitation. The good thing is that it's not as hard as it looks, so here are a few tips on how you can handle RV sanitation like a pro. It will take a little bit of effort on your part to maintain your RV waste tanks and keep them working the way they should. By using the proper sewer chemicals for the type of camping you do, you can keep your RV free from odor. The key to keeping odor under control is water, always begin your stay with your black tank at least a 1/3 full of water with the recommended amount of chemical for your size tank. If your worried about capacity, you can start out lower, but ensure plenty of water is used during each flush. Deodorizing chemical available by such brands as Aquachem and Thetford are generally adequate for weekend outings or when you will be frequently dumping your tanks. These type of chemicals are designed to mask the order, but only if there is plenty of water in the tank. Digestive type chemicals (also known as bio or enzyme based chemicals) are designed to break down waste and general work best when you only dump once a week or even longer. We found the Kronen brand of rv toilet chemical to be super fast acting at breaking down waste even during short dumping intervals. Make sure you are always using the appropriate toilet paper, such as septic tank safe or RV / marine toilet paper, which is designed to break down quicker and won't clog as easily. Just because your at a full hookup campsite doesn't mean you can leave your grey and black tank valves open for the duration of your stay. Keep them both closed! By leaving them open you not only are asking for a clog on the black side and soap scum build up on the grey, but you also allow sewer gasses to vent back into your RV from the rest of the campground. By allowing the grey tank to fill each time before dumping you reduce the amount of soap scum that can build up and dry on the walls of the tank causing a nasty grey water smell. 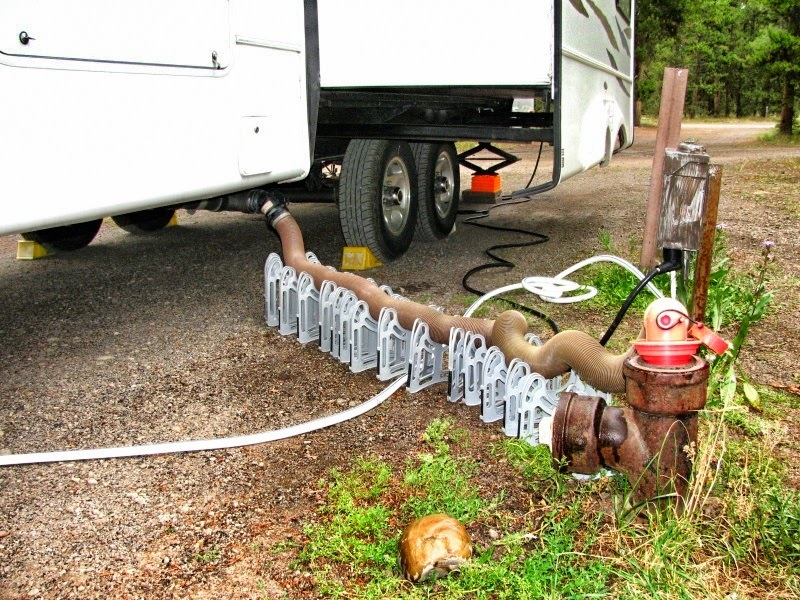 If you must leave it open due to a lot of water usage, be sure to make a P-trap in the sewer hose to eliminate the chance of campground sewer gases coming into your camper. Also allow it to fill with hot shower water at some point or flush the tank thoroughly if you have a rinse device. The black tank should remain closed and only dumped at the end of your stay or when full. Again water is the key to keeping odors at bay and be sure to use as much as the capacity and your usage will allow. Most everyone will tell you to always dump your black tank before your grey so that the grey water will rinse your hose clean and I would agree most of the time. If your using your tried and true sewer hose that you know is capable of handling a rush of 3" sewage, this is the best method. But, if you are using a sewer hose for the first time or your not sure of your setup, run some grey first to make sure there are no leaks or issues with the connections. If everything is working properly then flush the black and use the remaining grey to rinse the hose. It's a lot easier dealing with a little grey water spillage than it is black water, trust me! I am also a firm believer in installing tank flush devices into both the grey and black tanks. You may not be able to use the perfect tank dumping methods in every situation and the flush device will allow you to get them clean once you get to a location that will allow you to rinse the tanks out. If installing a tank mounted rinser is not possible there are also less convenient wands that you can put down the toilet or a sewer hose connection that allow back filling of the black or grey tank. DO NOT pull up to the dump station and pull the dump valve without a hose! All to many times we see new and old rv'ers alike make this choice and it's a bad one. It's unsafe and annoying for the next RV'er that needs to use the dump station, even if you rinse down the area which never is done completely. Either purchase a quick use sewer hose or make one from an old hose you may have laying around that will be used just for the dump station. It should be approximately 10 feet long depending on your sewer connection and will only need the connector on the inlet side with no connection on the dump station side. This type of hose is easy to handle and can be shoved down the dump station pipe quickly no matter what design they may have. Take the time when the dump station is empty to practice a routine to get you in and out quickly but safely. On those busy Sunday mornings when everyone leaves at the same time and you have a line of RV'ers waiting to dump their tanks behind you, you don't want to make a mistake that causes a sewage disaster that requires a hazmat suit for clean up. You don't always need the most expensive sewer hose to successfully maintain your RV's sanitation tanks. Most RV's will come with an inexpensive sewer hose that can get you through a few trips before making a decision on the best type of sewer hose setup. The type of camping you do will also dictate what type of hose makes the most sense along with how much you should carry with you. In most situation 20' of sewer hose in (2) 10' lengths will cover many of the campsite hookup locations. But the next issue will be carrying that much hose in a sanitary way. While there are some commercially made carriers some of the best solutions have come from RV'ers who have come up with their own much better sewer hose carrier systems. Here are a few of those in this google search of some of these ingenious setups. Not everyone knows where to start when it comes to their RV and that's why we are here to help. For all your RVing needs make sure you Contact Us so we can provide you with everything you will need for your next getaway. Also visit our website to view our inventory and great deals. Whether you own your own RV or are renting one for a road trip, RVUpgrades has made it our duty to make sure your RV and the experiences you have with it are as comfortable and enjoyable as they are supposed to be.